My second favorite holiday is coming up, Thanksgiving, and my second favorite thing (my first favorite thing is spending time as a family) about this holiday are the pumpkin desserts. Typically I only have pumpkin pie for my pumpkin dessert on Thanksgiving but this year I thought I would explore a few new pumpkin desserts for the big day. This first idea for the pumpkin desserts is one that I made early in October of this year. They were so easy to make, you could taste the pumpkin in each bite and the icing that went with paired very well with the cookie. It was also fun to spend time together as a family icing our cookies together! Pictures like these make me think about my childhood and how fun I always thought it would be to “blue skidoo” into a picture like they did on Blues Clues. This bread looks so moist and soft. I have a pretty good idea that if I ever made this it would soon become a new pumpkin favorite. I liked this idea because it is a fun twist on the traditional pumpkin pie and I love pumpkin pie, I have been counting down the days until Thanksgiving because I have been craving pumpkin pie so much the last few days, only 10 more days to go! One of my favorite breakfast desserts paired with one of my favorite flavors, I don’t know what could be more perfect? No baking? That means less time I have to wait to sink my teeth into one of my favorite pumpkin desserts! This dessert was actually referred to me by my mother in law. She said that it was delicious and after hearing her description of it and seeing this picture and because she is my mother in law who I love and trust, I am going to take her word for it and add it to my must make pumpkin desserts list! 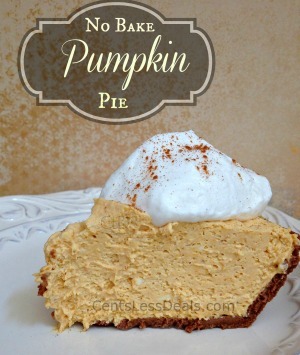 Another no bake pumpkin dessert! Also what a great presentation, a sure way to wow your Thanksgiving guests. I personally made this recipe last month during one of my surprise pregnancy cravings. All I knew was that I needed something with pumpkin and something with chocolate and I needed it as soon as possible. I can honestly say that this recipe sure did the trick! 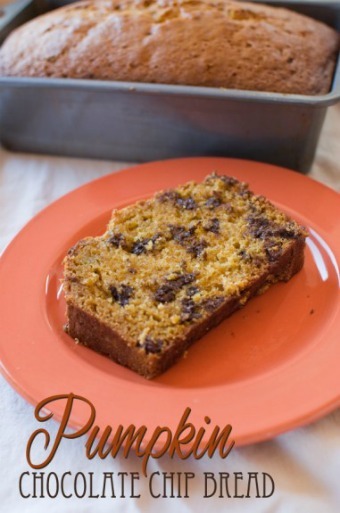 Very moist and a great combination of pumpkin and chocolate. I was also able to start making it around 7 and still eat a few pieces before I went to bed around 10! Another delicious looking pumpkin cake with a delicious looking frosting. Also it looks very simple to assemble but turns our beautiful, it would be a great addition to any Thanksgiving table! I am not a huge fan of cheesecake but after seeing these dessert bars I can’t help but crave them, I am also 8 months pregnant so most things I see I crave! I also think that all the other flavors and textures that go in this dessert bar would be a perfect combination for a great Thanksgiving dessert. Let me know what pumpkin desserts you are planning on making this Thanksgiving! 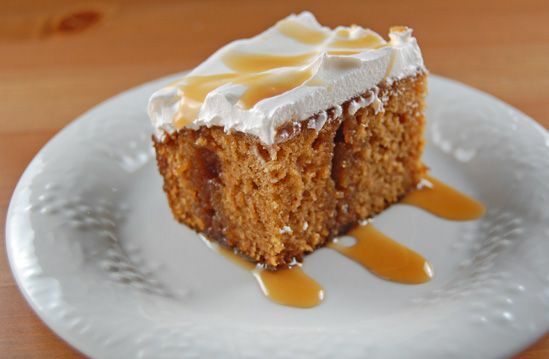 Which of the above pumpkin desserts look the most appealing to you? 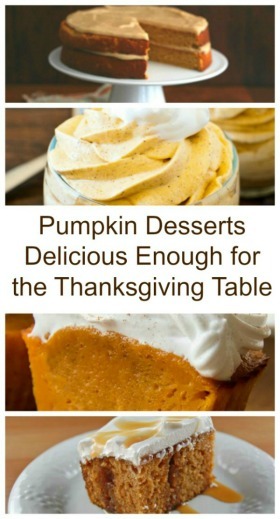 All of these sound amazing , think im going to try the Caramel Pumpkin cake ! My mother in law made that one for us when she came to visit in December and it was AMAZING!! I wish I had some right now! 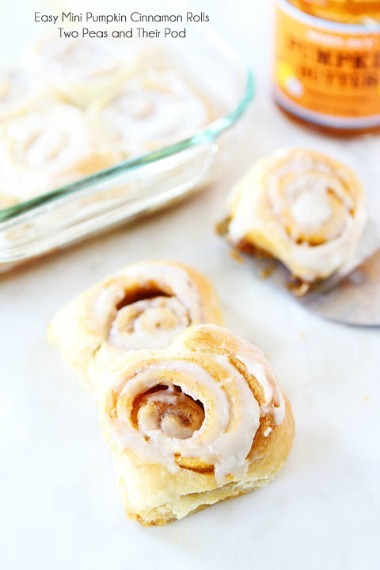 The Easy Mini Pumpkin Cinnamon Rolls look so yummy! I love cinnamon rolls! And add some mini chocolate chips! Yumm! I love the Cinnamon Pumpkin Bread. It looks so delicious. I will have to make this. You have a lot of wonderful recipes here! 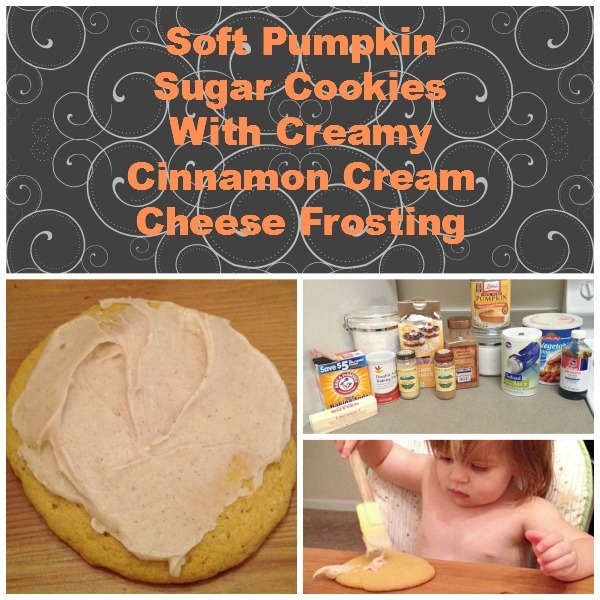 I love this time of year because of all the yummy recipes out there using pumpkin! 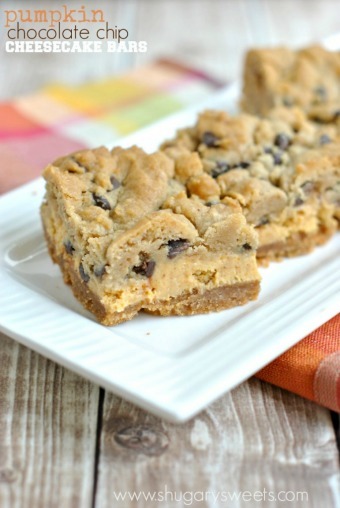 Thanks for sharing…the Pumpkin Chocolate Chip Cheesecake Bars sound wonderful. I’m definitely pinning these. Oh my gosh those look so good I am getting hungry! The Mini Pumpkin Cinnamon Rolls look delicious! I’d love to try it! What an amazing list of pumpkin flavored treats. I would love to try them all. I think pumpkin anything sounds delicious any time of year. Thank you for sharing some of these amazing looking recipes. I use to not care for pumpkin that much. It was something I liked but now I am addicted to anything pumpkin. Those pumpkin cookies look like something my grandsons would love. I think I might make them for Christmas. I really love pumpkin and all of these look delicious. Its a pity we only think of pupkin in the winter it really is good for you. 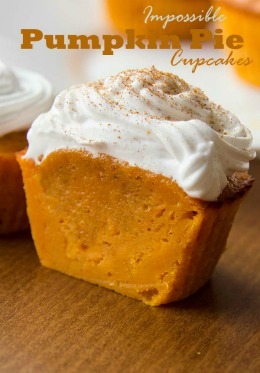 You have some of the most awesome pumpkin recipes listed here. 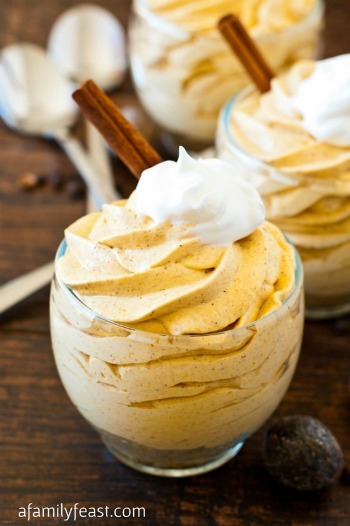 I love everything pumpkin so I am going to have to try these recipes. Love these recipes! 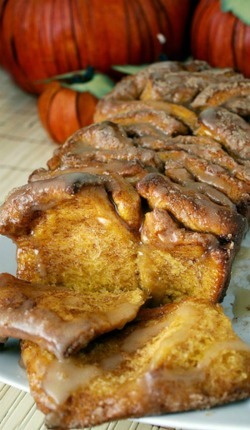 The Cinnamon Pumpkin Bread sounds delicious! 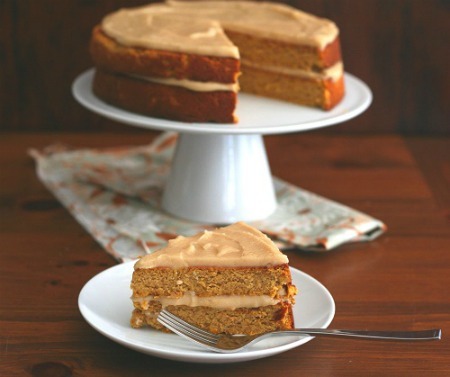 The Caramel Pumpkin Cake looks amazing! All the recipes look great. I love everything and anything pumpkin.